Jessica Skill is a Level 1 coach and has been helping Matt on poolside for a few months now. She used to compete for a club in Leicester and is now a student in Nottingham. 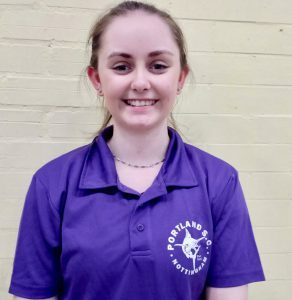 We'd like to thank her for volunteering to help coach at Portland, thank you Jess. Read more about Jess here. Congratulations to Edward Roberts (17) for qualifying as a Level 1 coach. Edward has swum with Portland since he was ten and now competes comfortably at County Level, with half an eye on some Regional times. We'll get a picture of Edward as soon as he stands still.